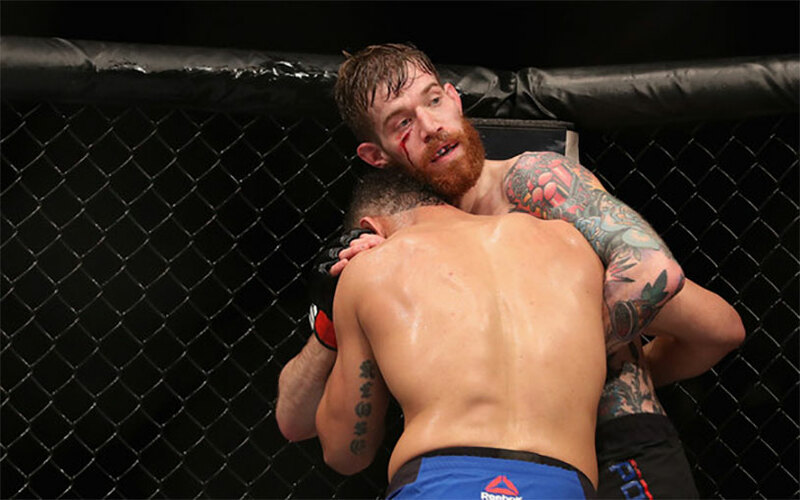 Life as a UFC fighter can be a constant grind – you need to make weight, stay in peak physical condition and also get enough actual combat experience that you’ll be able to handle anything an opponent throws your way. That can lead to lots of injuries – just ask Devin Powell, who went down in training to one of a man’s worst nightmares. Powell was getting ready for a future fight by sparring with teammate Joe Lauzon. The duo were on the ground and Lauzon delivered some crushing knees to Powell’s midsection. Unfortunately for him, one of them slid a little low and got him right in the man-bag. Insanely, the UFC fighter waited a day and a half before heading to the hospital for medical attention, but once there surgeons managed to drain the blood clot and get things squared away. He kept a sense of humor throughout the whole ordeal, posting on Instagram from York Hospital in Maine, but we’d have to think that the injury might set back his plans to return to the cage by a few months. Meanwhile, Joe Lauzon is set to square off with Chris Gruetzemacher on April 7th. Watch your junk, Chris.